Home Paint Protection Can A Clear Coat Be Applied On Top of A Vinyl Wrap? Can A Clear Coat Be Applied On Top of A Vinyl Wrap? You spent countless hours agonizing over just the right colors and graphics for your vinyl vehicle wrap, and now you are sporting the hottest ride in town. The question is: how do you protect the wrap to keep it looking this great? There is an entire following in the school of clear coat. It is easy to spray on, it protects the design from fading, and it repels road debris. However, there are a few things you should know first. Some vinyl wraps have a textured finish that gives graphic depth. A clear coat has the tendency to fill in the stamped pattern, which dulls the 3D quality of the design. Clear coating also has a reputation for changing the way light is reflected and it can cause a color change. If you decide to go with a clear coat, it is highly recommended that you test spray a separate piece of your vinyl material away from the car to see how it will react with the design and texture of your vinyl wrap. Try one coat, and then allow it to dry completely before applying a second or third coat. Take the sample out in the sunlight and really look at it from every possible angle. Compare it to your existing wrap and then decide if it really changes the look or color of the wrap. On a lighter note, many people who show cars with chrome wraps use clear coat to protect the wrap from fading. It is also a defense against incidental scratches and chips. Chrome wraps are more susceptible to damage due to the reflective nature of the vinyl. Clear coat is a favorite choice to lengthen the life of chrome wraps. Paint protection film, or PPF, is similar to your vinyl wrap, only it is clear. PPF can be used over your wrap for added protection of your graphics, but most companies suggest it be used as a “bra”. This means it is best used over the areas that take the most abuse such as the front bumper, or lower door panels. Daily driving will eventually cause gravel chips in the lower panels of your wrap. The PPF works like a shield, taking the damage while protecting the wrap. If you opt for a whole car paint protection film, choose a brand with a UV protectant. This will extend the life of your wrap by preventing sun damage to the graphics or fading of colors. You should keep in mind, this is essentially going to double wrap the vehicle, so be prepared to allow for more time to complete the process. 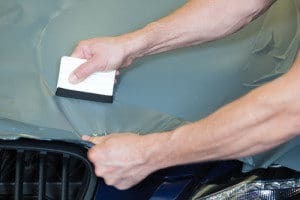 No matter which option you go with, bra or whole car, PPF or clear coat, keep in mind that none of them are going to save you from having to care for the vehicle. They are not super shields and still require the same cleaning as untreated vinyl vehicle wraps. 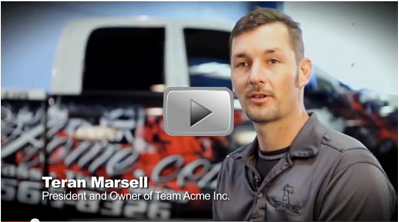 The staff at Team Acme is skilled in all aspects of vinyl wraps. We have certified techs with years of experience that are prepared to answer any questions you may have about your vinyl wrap. Call today (702) 566-8326 or visit us on our website and check out all the services we offer. We would be glad to work with you to make the best decision for you and your car.